What the shoe is to comfort and the plate is to stability, the wheels are to manoeuvrability, speed and balance. Needless to say, pro skaters take especial care to choose the very best wheels, often changing them as they shift from one activity to another. Recreational or aspiring derby skaters need not aim for that level of wheel precision, but it is still important that when you’re choosing the best roller skates wheels, you know what combination of durometer, width, lips, contact patch, core and materials to choose from. If this seems a bit overwhelming, let us break them up for you below. One of the oft neglected aspects of the wheel is the actual width of the wheel. In technical terms, this means the width of the area that appears to come into contact with the surface. In other words, it is the width of the cylindrical surface of the wheel. This width, measured in millimeters, is different from the diameter (more on this below). However, what you actually need to consider is the contact patch ie the width that actually comes into contact with the surface. Many wheels have curving edges that prevent the entire wheel width from coming into play. These edges are called lips. In layman’s terms, the greater the width of the wheel, the harder it is to maneuverer but the more stable it is. The lower the width, the easier it is to change direction but stability is compromised. For this reason, figure skaters choose narrower wheels, so they can change direction quickly. Experienced derby skaters also prefer moderately narrow wheels since their needs are somewhat similar. 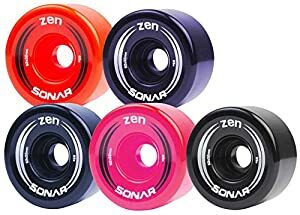 However, beginners are advised to go for wider wheels since these help if you make any mistakes while skating. The same applies for lips as well. Squarer lips ensure more of the width translates into the contact patch, while rounded lips ensure the opposite. As a rule of thumb, the squarer lips ensure greater traction and stability, but demand more effort from the skater. You would also have to account for sticky surfaces since squarer lips can be a real problem there. Going for rounded lips, while helping you move more nimbly, can reduce overall stability. Diameter literally refers to how big the wheels are, and is measured from one end of the circle that is the wheel to the other end, across the core. Here it should be noted that inline skates have larger wheels, going up to about 100mm, while quad skates have smaller wheels. For this reason, swapping inline and quad wheels is not possible and should never be attempted. Deciding on the diameter is simpler than the above choices. Available as the first part of the skate’s specifics eg. 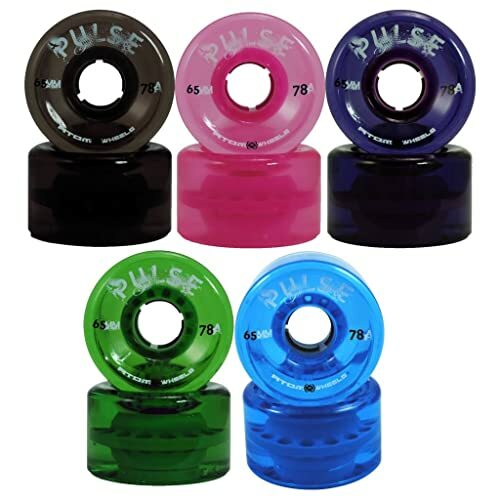 78mm/90A, it tells you how high above the ground you would be when you skate. Generally, aggressive and experienced skaters prefer smaller diameters because this allows them to move with less effort and keeps their center of gravity closer to the ground. However, smaller skates provide less motion for each move of your feet, and can slow you down relative to others. A higher wheel on the other hand makes you somewhat less stable because your centre of gravity is higher up. More effort is required to make the large wheels turn, but once they begin turning, the speed you need is quickly attained. Durometer on the other hand, refers to the hardness of the wheels. Outdoor wheels begin at around 73A and end at around 85A, while indoor wheels begin at 85A and can go up to 106A. In other words, the outdoor wheels are softer and the indoor wheels are harder. The reason for this variation is that indoor rinks often have hard surfaces like concrete or treated wood, while outdoor gravel and pavements tend to be softer and more grippy. The decision regarding diameter and durometer is really user-determined. If you’re going for outdoor races and marathons, then larger wheels with low durometer are advisable. 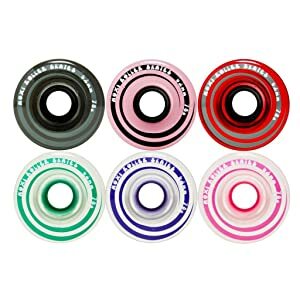 If you’re into figure skating or indoor races, chances are smaller to medium wheels and high durometer will be your sweet spots. If you’re into recreational skating, you can choose a middling durometer and a high diameter to achieve the best workout while ensuring that your skates work both on the rink as well as outdoors. The weight of the wheel determines how much effort has to be expended per metre moved. Heavier wheels naturally demand more effort, but choosing light wheels isn’t a no-brainer. This is because heavier wheels provide stability, which can come in handy if you’re learning to skate or are tall and/or on the heavier side. Once you have obtained intermediate level skating skills, it may be time to move to lighten and less fatiguing wheels if you find yourself being dragged down by your current ones. Lastly, the material at the centre of the wheel also matters. Called the core, this material may differ from the material of the wheel itself. Generally, the cores are made of nylon, aluminium or nothing ie the core is hollow. Nylon cores, when combined with similar wheels and plates, tend to be rather light and easy to manoeuvre. However, they don’t translate your effort into motion so effectively because they can’t act as the strong centre which keeps the rest of the wheel perfectly round. Net result is that you end up expending more effort to keep the wheels moving. Despite this, nylon cores may be ideal for beginners and those on a budget. Aluminium cores are the costliest and often the heaviest as well. They move energy very well and keep the wheel perfectly round. They are ideal if you’re planning on taking part in derby or will be skating for long periods where energy conservation is of paramount importance. Lastly, hollow cores score somewhere between the two, and can be useful for beginner to intermediate level skaters or those who wish to keep their feet light while avoiding the problems of the nylon cores.